A New Jersey high school wrestler was forced to cut his dreadlocks or else forfeit the match. A New Jersey high school wrestler who was forced to cut off his dreadlocks before a match to avoid forfeiting was asked to cover his hair before another match this week — the result of an "unrelenting fixation" on the boy’s hair by wrestling officials, his attorney claims. Buena Regional High School junior Andrew Johnson, 16, and his team were supposed to compete in a wrestling meet on Wednesday, attorney Dominic Speziali said in a letter sent to the New Jersey Division on Civil Rights, which is investigating the December incident. 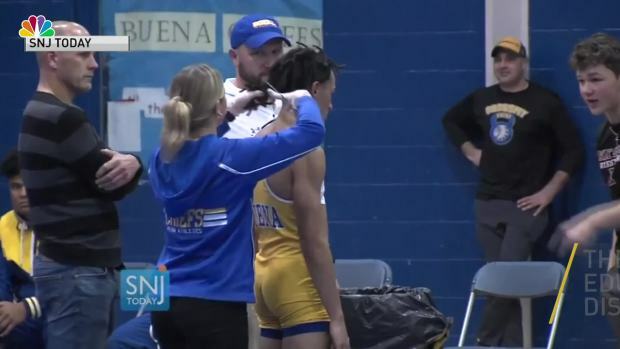 A day before the meet, a referee contacted Buena’s athletic director and said Johnson would have to wear a covering over his now cut hair if he planned to participate in the meet, Speziali said. After some back and forth between the Buena school district, the New Jersey State Interscholastic Athletic Association, the New Jersey Wrestling Officials Association and the National Federation of State High School Associations, the meet was “abruptly canceled, without explanation and to the dismay of Andrew, and conceivably his teammates, who, like all wrestlers, must prepare and sacrifice in the lead up to every match,” according to Speziali. At a board of education meeting Wednesday, a local official expressed outrage toward a referee who made a black high school wrestler chop off his dreadlocks before a competition. The cancellation came two days after a NJSIAA wrestling official allegedly sent out an email with photos of hairstyles that would require coverings during matches, including a photo of "a young black man with a short twist out (a similar hairstyle to that of Andrew’s after his hair was cut),” Speziali wrote in the letter. “The motivation behind the NJSIAA’s email reinterpreting the applicable rules isn’t clear, but it does not appear to be based on any known, or even alleged, safety issues that have recently come to the fore,” Speziali wrote. Speziali claimed the email’s “questionable timing” was an attempt to “garner support” for Alan Maloney, the referee who told Johnson he'd have to cut his hair. A now-viral video tweeted by a reporter in December showed an official cutting Johnson’s dreadlocks after Maloney, who is white, told Johnson, who is black, that he would have to get a haircut or forfeit the match. Johnson participated in a tournament on Saturday "without wearing a hair covering and without any referee raising an issue about his hair,” Speziali noted in his letter. “Andrew, his family, and, I would venture to say, the entire Buena wrestling team all desire to return to how things were before Alan Maloney’s actions set this chaotic atmosphere in motion,” Speziali wrote in his letter. “Yet it appears, for reasons that the Division can hopefully soon unmask, that certain officials have a desire to unnecessarily escalate and prolong this ordeal due [to] an unrelenting fixation on the hair of a 16-year-old young man that asked for absolutely none of this,” Speziali added. News 4 has reached out to NJSIAA for comment on Speziali's letter.